Here is my dinner menu for January — it will take very little time to shop for the ingredients or prepare this healthful dinner for four. It is important not to overcook the pork chops. Bon Appetit! Place 2 cups stock, the dried cherries and balsamic vinegar in a small saucepan over medium heat and simmer gently until the sauce is reduced by half. Set aside. 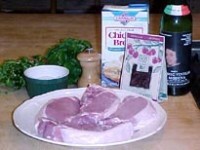 Twenty minutes before serving, sprinkle each side of each pork chop with salt and pepper. 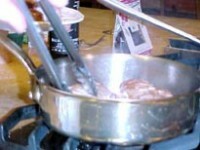 Place the olive oil and butter in a medium-sized saute pan and heat until the bubble subside. Place each chop carefully in the pan so they are not touching. Leave them to brown without moving for 2 to 3 minutes. When the chops are a brown, turn with tongs and brown the other side. Remove the chops from the pan, pour off any fat, add 1/2 cup chicken stock. Return the chops to the pan, place over low heat, cover, and cook gently for 3-4 minutes, until the chops are just firm when pressed with a finger. Remove the chops and keep warm. Add the balsamic-dried cherry mixture to the saute pan and bring to a boil. Let the sauce simmer for 5 minutes — it should coat the spoon again. Taste, add salt and pepper to taste. 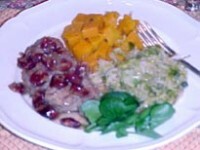 Place the chops on warm dinner plates; spoon over the dried cherry sauce. Garnish with sprigs of watercress. Melt the butter in a wide, heavy saute pan. Add squash and toss to coat. Add 1/2-inch of water and 1/2 tsp. salt. 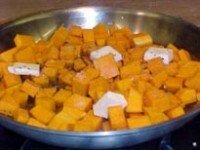 Cover and cook until squash is tender but still holds its shape, stirring frequently, about 15 minutes. Season to taste with salt and pepper. 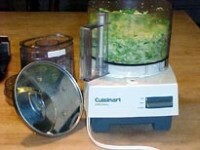 Cut the stem from the brussel sprouts and slice them into thin slices, about 1/8 inch thick or shred them in an electric food processor. Place them in a large bowl and toss them with the lemon juice. Place the butter in a heavy saute pan, melt over medium-high heat and continue to cook until the butter turns chestnut brown. Add the brussel sprouts with lemon juice and capers. Heat thoroughly, add 1/2 cup water and cook 2 to 3 minutes, stirring, until the Brussel sprouts are softened; taste and add salt and pepper to taste.